Listen to the audiobook version here. Even though I was brought up vegetarian, I now eat only an insignificant quantity of plants; my diet consists of essentially only animal sourced foods. Yet, I consider my diet to be exquisitely balanced in nutrients, and I feel healthier now, in my forties, than I ever felt in my twenties. In this section I describe my battle with weight and bipolar depression, and how I accidentally found a surprising solution. You see, I don’t eat plants. Sure there are a few items of plant origin that pass my lips now and then. I drink coffee every day, and that’s definitely a plant extract. I will sometimes eat some spices if I’m out at a restaurant, or a guest at someone’s house. I’ve even been known to eat a few pieces of the shredded radish served with sashimi, an occasional dill pickle, or a square of unsweetened chocolate. These latter are rare indulgences; perhaps a couple of times a year. The point is that plants make up a tiny, insignificant portion of my diet. My “balanced” diet is a diet of essentially exclusively meat. To be more technical about it, I should say “animal sourced foods”, because some people quibble about that. I eat liberally of the fat and flesh of a variety of animal sourced foods. I eat ruminant animals, like beef, lamb, and goat (when I am lucky). I eat pork, poultry and eggs. I eat fish and shellfish, and I sometimes eat dairy foods. This gives me everything I need to be healthy. I’m using the word balanced here tongue in cheek, because I’m not actually aiming for some specific ratio or target amounts. I enjoy the pleasure of variety, but I don’t think it’s an important consideration in this context. As we will see later, the idea that a diet needs balancing is a misguided transfer of concern that comes from plant based diets, which are inherently difficult. Plants do not themselves provide proper nutritional coverage for human needs, so they have to be combined carefully to avoid malnutrition. A meat-based diet is completely different. 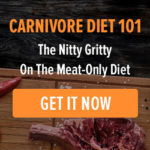 Most regular sources of meat are individually nutritionally complete, and it is typically difficult to create deficiencies or imbalances without strange extremes of exclusion. However, my diet may sound like an extreme of exclusion to you, even given this variety of foods I enjoy. This is a result of enculturation. We always consider large deviations from the norm in our environment to be “extreme.” I am no stranger to being considered strange, and to having to go out of my way to eat the way I do in social situations. The question that comes up, then, is why? Why would I avoid eating food that the rest of the culture I’m embroiled in considers healthy? Why would I go out of my way to eat so differently? Here are some proposed reasons that are not why. I am not simply an extremist choosing some way to express extremism. Nor am I driven by puritanical or ascetic motives. If anything, I tend toward hedonism! Anyone who knows me at all would find that notion ridiculous. I have not fallen prey to all or nothing thinking, or the mistaken idea that if lowering carbs is good, then no carbs at all must be better. It’s not even because I don’t like vegetables. To the contrary, I was brought up vegetarian, and have always loved vegetables and vegetarian food. Indeed, at one time I prided myself on my vegetarian cooking skills. The reason that I don’t eat plants is pragmatic. I stopped eating plants in the hopes of losing weight, and I continue to avoid them ten years later because of the mood stability. When I stopped eating plants, the mood disorder I’d been suffering from my entire adult life theretofore was put into remission. Let’s rewind a little. As I mentioned above, I was brought up (lacto-ovo-and-occasionally-pesca-)vegetarian. My parents were conscientious. Almost everything I ate was cooked at home. We ate whole grains, legumes soaked in house, and a wide variety of other plants, with as much of the fibre left intact as possible: juice with pulp, veggies with stalks and stems, peels on. I was taught about the importance of constructing complete proteins. There were books on the shelves about vegetarian nutrition. I was not forbidden from eating meat, and did so outside the home at my grandparents’ houses, as a guest, and occasionally at restaurants, but meat made a small contribution to my diet on the whole. I was chubby as a child, especially between growth spurts, but not extraordinarily so. However, when I first went to university in 1992. and suddenly had access to as much food as I cared to eat, I started to gain weight very rapidly. I was up 30 thirty pounds in my first year, which was very distressing and embarrassing to me. However, it seemed intuitively obvious to me that the solution to that would be to take up exercise classes and to return to a “healthy” vegetarian diet. To my surprise, these changes did not cause me to lose weight, though they may have slowed the gain. I increased my efforts by exercising an hour every day, adding some light weight lifting in addition to the cardio I was already doing. Eventually I decided to give up all animal foods and eat a vegan diet. None of this helped. In 1997 I went to Saint Petersburg, Russia, for a semester, as part of the Russian degree I was pursuing. It was very difficult to maintain my vegan diet abroad, and at a certain point soon after arriving, I decided that for the remainder of the semester I would eat with my hosts as they were eating, and I could return to my vegan diet when I returned home. However, when I returned home, I realised that I had actually lost weight while away. Even though there could have been a variety of explanations for this consistent with my belief that veganism was the healthiest diet, something about the situation made me step back and reassess. I had heard about low carb diets, and decided to find out more about that way of thinking. Timing was on my side. Michael and Mary Dan Eades had just published their classic Protein Power. That book still stands out to me for its excellence. Even though many books have since been written on low carb diets, including new research that wasn’t available at the time, it’s still my number one recommendation on the topic. Protein Power had science in it, from archeology to biology, as well as clinical experience. I was enthralled with what I was reading, because it was counter to everything about nutrition that I’d heard up to that point, and it somehow still managed to be compelling. Not satisfied with taking any of it on authority, I went to the local medical library and found the papers they cited and read them for myself. This was legitimate science, and it gave me hope. By implementing what I learned in that book I quickly lost the excess weight I’d been lugging around since I was a freshman, and I looked and felt better than I ever had in my life. I stayed on this low carb diet for over a decade, and continued to read new studies with avid interest, but not everything worked out the way I wanted. For one thing, I found it very difficult to eat low carb during pregnancies. It’s not that I was worried about the safety of it, but I had physiological difficulties. I am in the unlucky position of coming from a long line of sufferers of hyperemesis gravidarum. It’s a rare hereditary condition in which pregnancy is accompanied by extreme nausea. In many cases, including my own mother’s, it requires hospitalisation because of the dehydration of constant vomiting. For whatever reason, my own cases were less severe than those of most of my family members, but I was still constantly plagued by nausea that made it difficult to eat anything but the blandest of high carb foods. Unlike what happens to many others, I rarely actually vomited, but I felt the constant need to eat to soothe the nausea. In addition, I had giant surges in carbohydrate cravings. Looking back, I realise this corresponds to the hormonal drive to fatten that happens, especially in early pregnancy, for obvious reasons. In the first trimester insulin production and sensitivity increase for this purpose. After a certain point, I was simply off the wagon, and the carbohydrates fueled their own cravings. The consequence of all of this was that I gained a lot of weight during both of my first pregnancies, and oddly, when I returned, post-partum, to my regular low carb diet, I lost some, but not all of the weight. In fact, I appeared to be very slowly gaining more weight. Whether it was a change in hormones from the pregnancies, a sad fact of aging, or a result of the anti-depressant medications I had been taking (did I mention I struggled with depression?) something was preventing the diet that had served me so well in the past from helping me maintain my ideal healthy weight. I hated this for so many reasons. I stayed low carb, though, because it was the best solution I had found so far. And any time I strayed, I began gaining at an alarming rate. Still, I was always looking for an answer. My cupboard was full of the expensive remains of failed experiments: maybe it’s a vitamin or mineral deficiency, maybe I need carnitine, maybe I need to cleanse my liver. By the end of 2008 I weighed almost 200 pounds. I avoided the scale, so I don’t know the peak for sure, but it was at least 195. I felt dejected, discouraged, and ready to try just about anything. Right about New Year’s Eve I discovered an Internet forum called Zeroing in on Health where people were discussing their results from going from a plant-heavy low carb diet, to a plant-free low carb diet. They were seeing improvements in their weight and health. Health was emphasised, even in the name of the forum, because the weight loss was so often eclipsed in importance for a lot of people who were experiencing exciting, unexpected, and often dramatic health improvements, in things like mood, asthma, arthritis, digestive problems, and fertility. They called this approach to eating “zero carb” or ZC, and a lot of people still call it that for historical reasons. I don’t call it that, because it has nothing to do with carb counts, and that seems to cause endless confusion. The very low carb count is simply a side effect of not eating plants. There are, in fact, a few grams of carbohydrate in liver, eggs, shellfish, and cream, for example. (Most people were also avoiding regular milk for the separate concern of total carb count, though.) On the other hand, vegetable oils have no carbohydrate at all, and people on this diet don’t consume vegetable oils. For this reason, I, and a handful of others, have long been calling it simply a carnivorous diet. Out of desperate vanity, I decided to give this a try. My plan was one of temporary extremism. I was going to try this diet for exactly 3 weeks, hopefully losing several pounds, and then taking a break to reassess. I planned it to end exactly on my 36th birthday, and to break it with a well-earned slice of (low carb) cake. And it worked. It worked beautifully. I immediately started losing weight very quickly and effortlessly. In the early days it was often a pound every day or two! However, there was something else entirely unexpected that changed my life forever. Remember that depression I mentioned? My weight wasn’t the only thing that was steadily spiralling out of control. My first depressive episode came that same first semester along with my weight gain. I was diagnosed with major depressive disorder, and put on antidepressants. Over the years my depression had gotten worse. Not only did it keep returning, and affecting me for long periods, but things began to change. I had a few episodes of what they call hypomania . Hypomania is characterised by excitement, confidence, happy extroverted interactions, increased libido, and bursts of creativity. Hypomania is actually pretty darn good, especially in contrast with depression! I think the Holy Grail of anyone with bipolar disorder is to stay in that state perpetually, because it feels amazing. The problem with it in standard bipolar disorder is that it’s a temporary state right before you lose touch with reality. Confidence becomes grandeur. Creativity becomes scheming to execute mastermind plans that you’re willing to spend money you don’t have on and burn bridges for, because this brilliant plan is worth the sacrifice. It typically ends in the hospital with a train wreck in its wake. Luckily for me, in a way , I didn’t have that kind of bipolar, or at least it hadn’t gotten to that point. What happened to me was that these hypomanias were rare and short, and were always preceded by long suicidal-leaning depression and despair. Over time, the cycles began to get faster and the hypomanias morphed into something much less fun: so-called mixed states including irritability, agitation, even anxiety, which I’d never experienced before in my life (I was so laid back that as a teen I once had a Buddhist monk I was talking to on the streets of Montreal tell me I was one of the mellowest people he’d ever encountered). I was re-diagnosed from major, treatment resistant depressive disorder, to Bipolar Type II, that is, bipolar with no psychosis or mania. Believe me it’s a booby prize. Initially I was happy about the diagnosis. Even though “Bipolar” sounded serious and scary, I had renewed optimism about my prognosis. Perhaps the reason that none of the years of therapy and medications had helped was because we were treating the wrong disease. It seemed to me that this opened up whole new classes of drugs to try, and maybe they would work better, and my life would get better. At the time I still believed the mental-disorders-as-brain-imbalances model of thinking. In retrospect, it makes no sense at all. Saying that a person has depression because they have a chemical imbalance in the brain is sheer question begging. It adds nothing to the explanation! It’s like saying that your nose is stuffed up because it has phlegm in it, an imbalance of bodily humours. Of course depression is reflected in the brain with a biochemical profile! To think otherwise is to evince naive mind-brain dualism. More to the point though, correcting an imbalance with a drug without addressing the cause of the imbalance is asking for trouble. You see if the body is biochemically creating a certain signature biomarker profile, for example high levels of blood sugar, or low levels of serotonin in the synapse, and then you interfere with that from the outside by adding insulin in the one case, or inhibiting re-uptake in the second case, the body is simply going to fight to adjust. This is the primary problem of clinical medicine today. In my case, Bipolar medications were worse than the disease. None of them helped and they all came with side effects. Lamotrigine gave me a bizarre and disconcerting sensation lovingly referred to on the Internet as brain zaps. Another one, I can’t remember which, caused me severe word recall problems. I thought I was losing my mind, my cognitive ability. It was terrifying. Seroquel turned me into a zombie; when I wasn’t actually sleeping, I might as well have been. Abilify gave me such intense anxiety that I thought I or one of my children was on the verge of death at every moment. It was a nightmare. About two weeks into the all meat diet, I realised that I had been feeling great; cheerful, happy, imperturbable. I mentioned it tentatively to my then-husband, Zooko, and he became very serious. “Amber, I haven’t known how to bring this up, but your mood has been dramatically better. I have never seen you this stable for as long as we’ve been together.” It was at that point that I began to realise the magnitude of what was happening. When I stopped eating foods of plant origin, my depression, my mood disorder that had been worsening and ruining what was left of my life, quite suddenly vanished. And I was left stunned. How was that even possible? Sure, grains and legumes are arguably a poor match for a human digestive system, and starches promote fat gain, but aren’t vegetables the very epitome of wholesome goodness? I had to go back to the beginning, to re-examine all the nutritional beliefs I had and why I held them. This book is an attempt to convey what I’ve learned since then, a decade ago. I hope that it is of interest. If it helps anyone to even a small fraction of the extent that it has helped me, I will be glad. Mood disorders aren’t the only situation in which a carnivorous diet has been found helpful. Since I began I have read countless anecdotes from people who have also found relief from illness, and, at least before word started getting out, these remissions were, like mine, complete surprises. In particular, many people have found total or partial remission from autoimmune or autoimmune-like disorders, such as arthritis, asthma, multiple sclerosis, Lyme disease, and others, and from digestive issues such as inflammatory bowel disease. I don’t know why this is (though I have some ideas), but the fact remains. For those of us who eat this way to resolve serious physiological conditions, weight normalisation is just a happy side-effect. I’d also like to bring your attention to a group of physicians in Hungary at the International Center for Medical Nutritional Intervention (formerly Paleomedicina). They have been treating patients with a variety of problems with a diet much like the one I use: an ad libitum diet of fatty meat, and either nothing else, or a limited amount of some particular plants that seem to have low likelihood of causing harm. They are finding that this diet has high success rate and no side-effects, and they attribute these qualities, as I do, to its excellent match with our evolutionarily adapted bodies. In retrospect, this was probably induced by the antidepressants themselves. It first started after a change in medications, and it was always while drinking a lot of coffee. There is a hypothesis that antidepressants do speed up the onset of bipolar disorder, and many people advise strongly against their use if bipolar is at all suspected or confirmed.